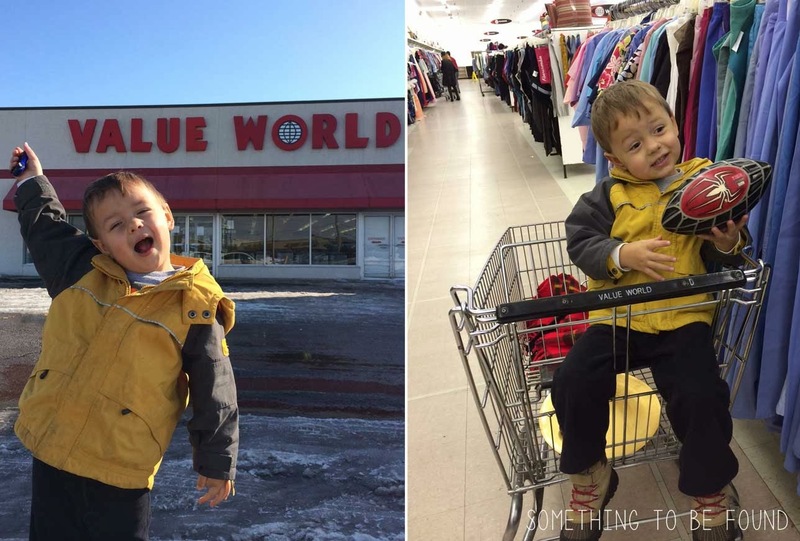 Welcome to month 3 of the thrift challenge...and our very FIRST reader challenge!! 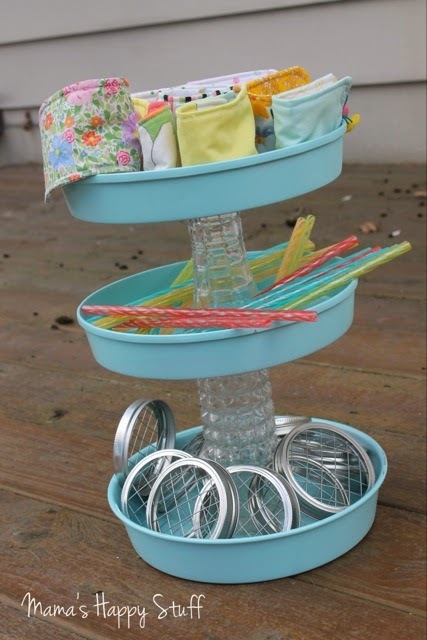 Dina challenged us this month to DIY a 3-tiered stand. 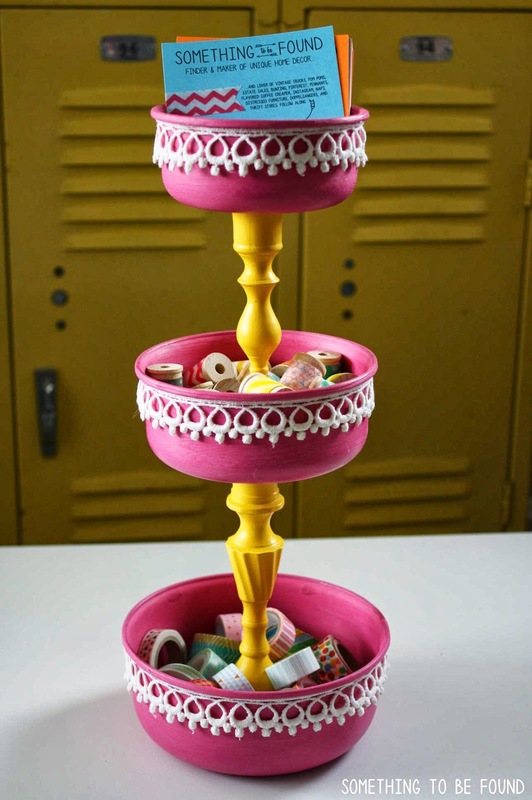 The only rules were that it has to have 3 tiers and the items used to make it must be thrifted (not including glue, paint, etc). First up is my take on the challenge, followed by eight awesome submissions from readers! Be sure to scroll through all the reader submissions and cast your vote for your favorite in the yellow box at the bottom of the post. (Voting is now closed). 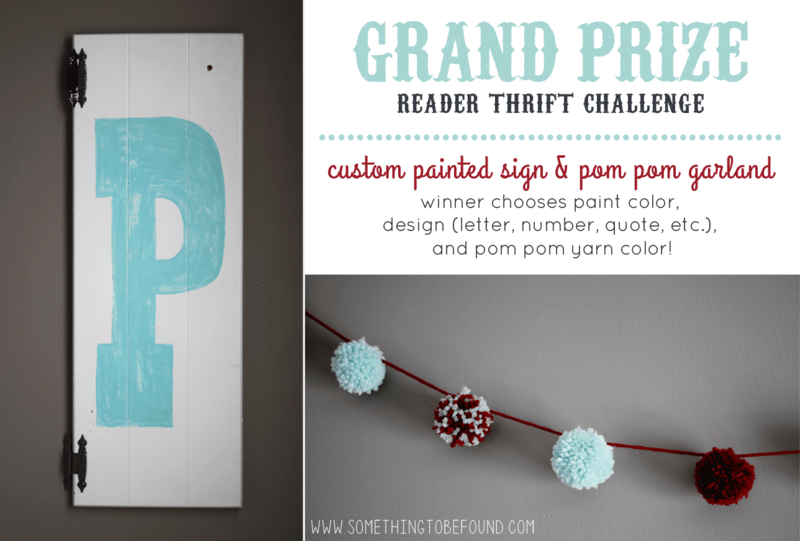 The winner receives bragging rights, plus a custom hand painted sign and pom pom garland. During the ONE semi-warm day we've had the past month I spray painted everything with a white primer. I would have then spray painted them with color, except it's literally been snowing or below 30 the past week and a half! So I busted out the paint and paintbrush. 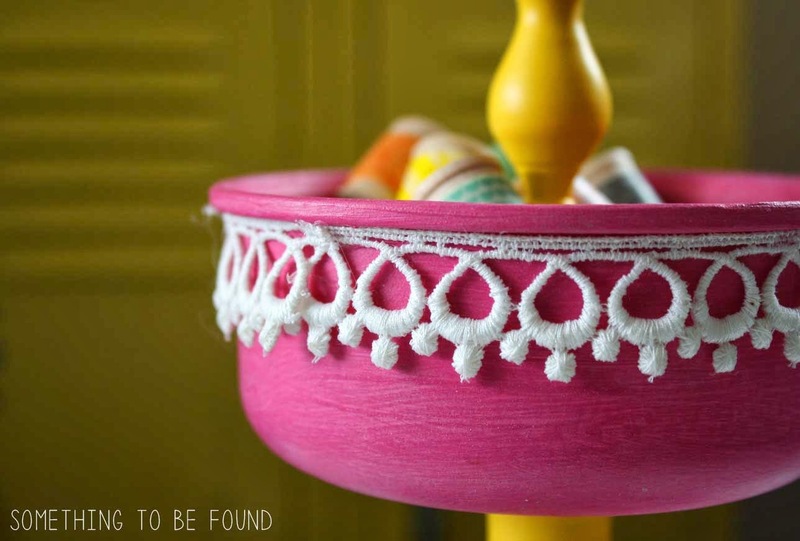 For the bowls I used basic Americana acrylic craft paint in Royal Fuchsia mixed with a little bit of plaster of paris to make sure it would adhere really well. After about 4 coats, I lightly sanded the bowls and sealed them with Annie Sloan Clear wax. 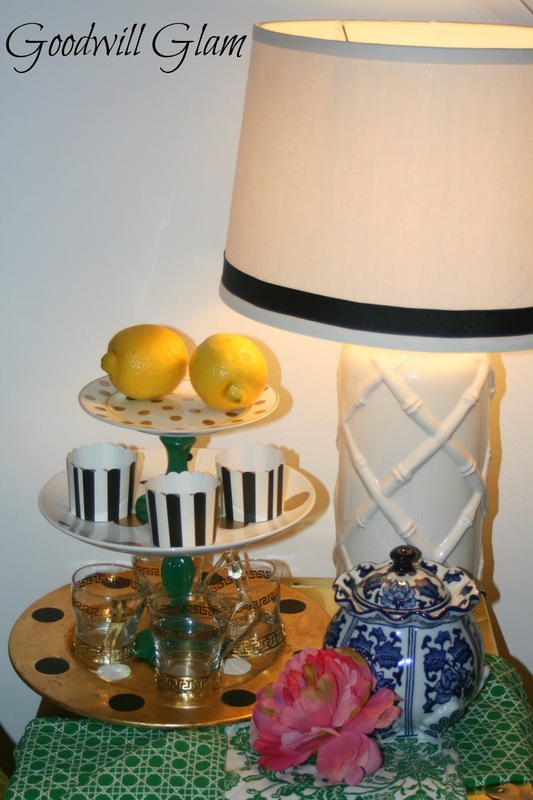 For the candlesticks I used Behr's Yellow Carat in satin (same color from this side table I painted) and did 3 coats. 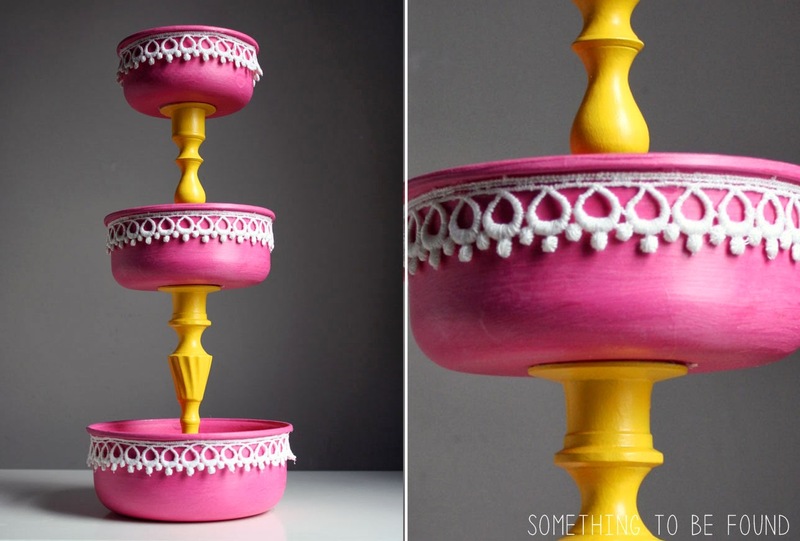 No sanding or waxing on the candlesticks. Not sure why, just didn't. To sass it up a bit, I glued on some white lacey trim. I tried attaching everything with hot glue and it kept falling apart -- Ithink because of the annie sloan wax it wouldn't adhere. I found Krazy Glue in the junk drawer and that seemed to do the trick! The stand quickly become my washi tape holder / business card decorating station. And now for the reader submissions!!!! 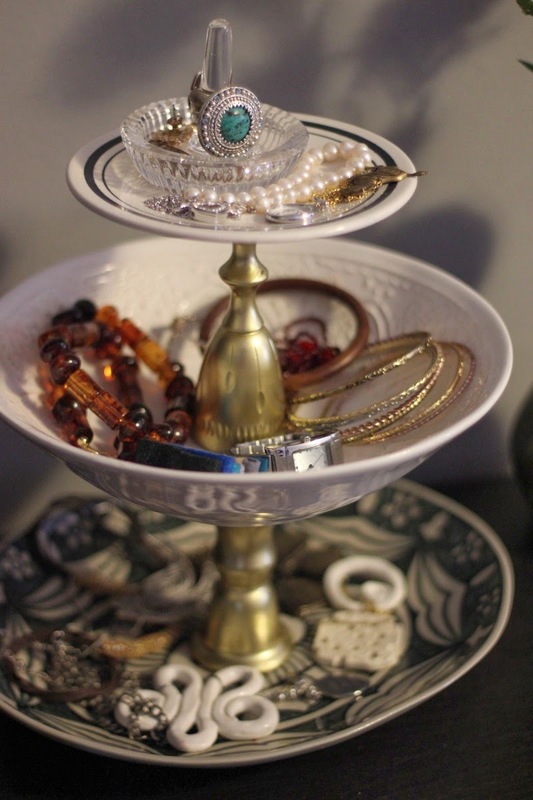 Emily used three thrifted bowls and platesand used 527 glue to connect them to a candlestick and a mini wine glass that she spray painted gold. 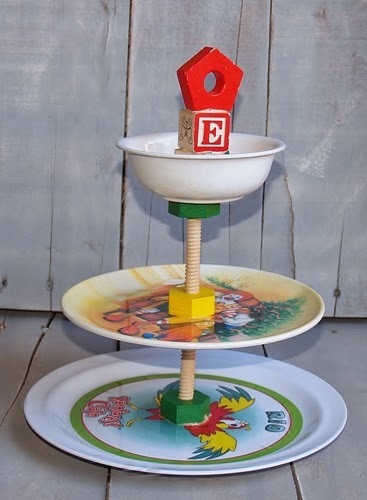 Kelli used 2 plates and a bowl connected by wooden tinker toys and wooden blocks. She used Gorilla Glue to hold everything together. 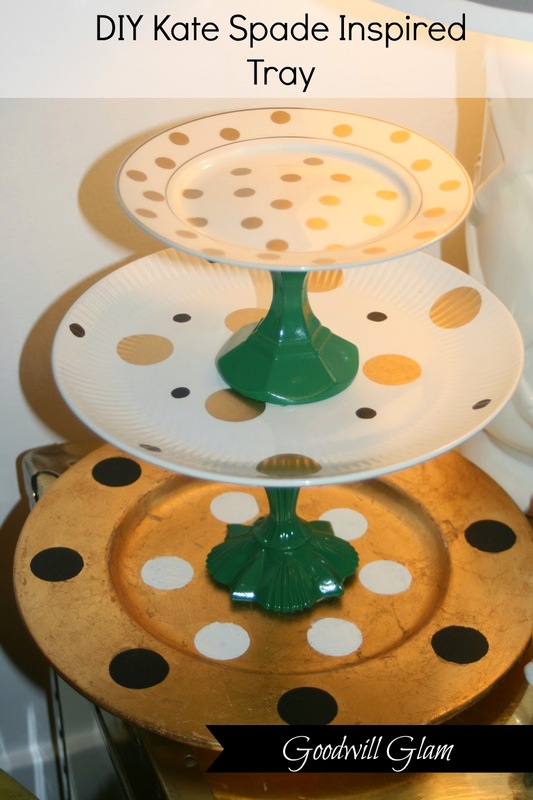 Krista used 3 plates that she decorated with gold, black and white polka dots. 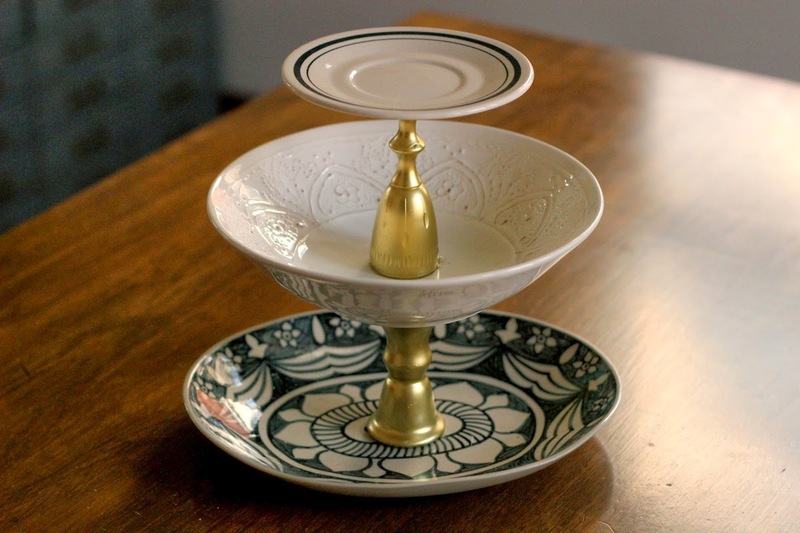 The plates were connected together by candlesticks that she painted green. 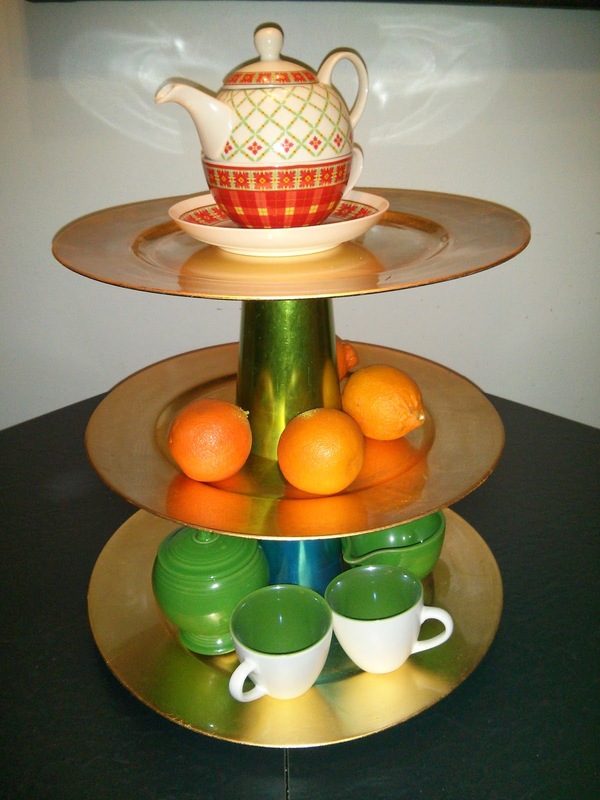 Megan was lucky enough to find an actual 3-tiered stand at the thrift store. 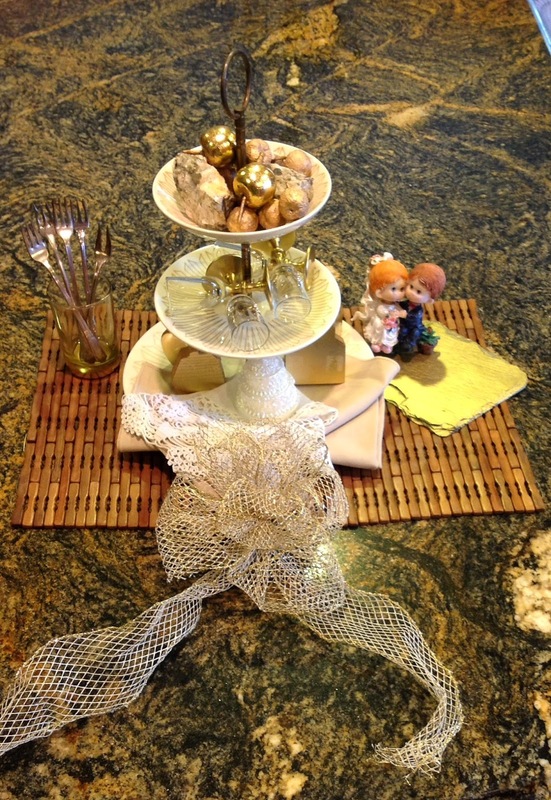 She then decorated it for a gold/cream/white wedding theme using all thrifted items. 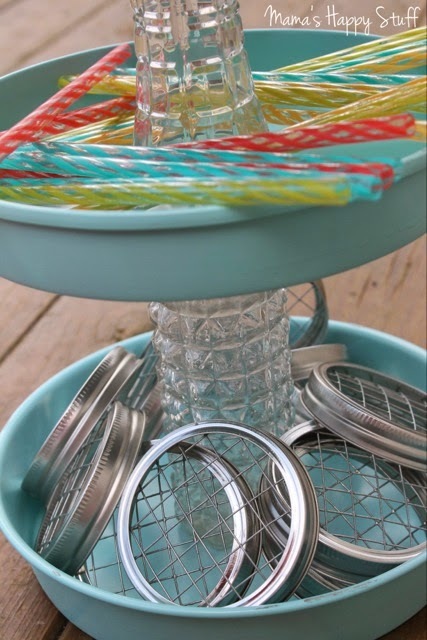 Christine used 3 metal cake pans spray painted turquoise, then connected them together with glass vases by using magic E6000 glue. 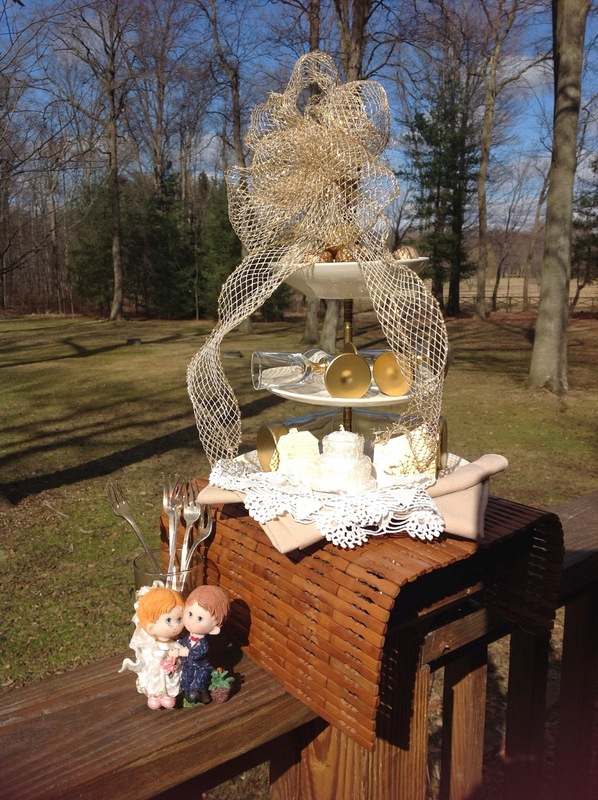 Amberly used a broken 3-tiered stand and added crochet tiers made from heavy duty cardboard. 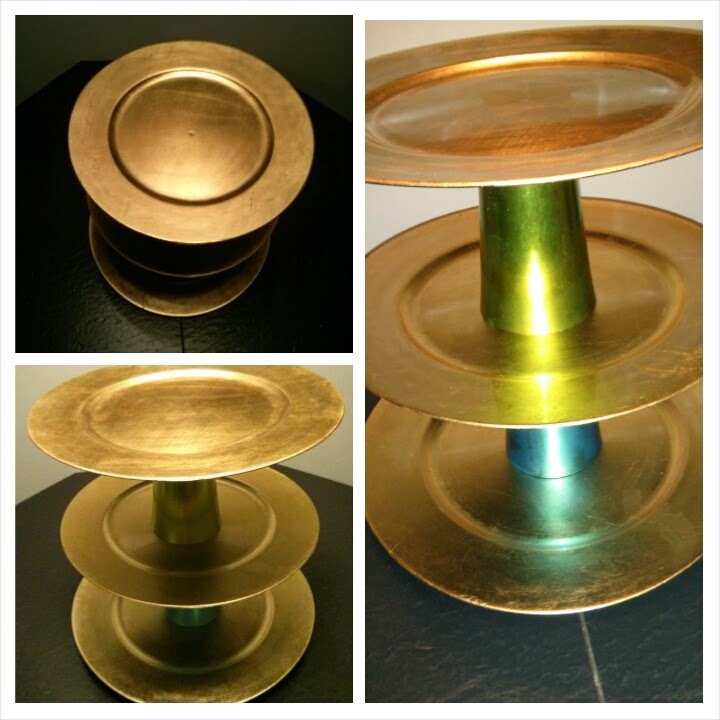 Shanie used 3 gold charger plates super glued to two metal cups. 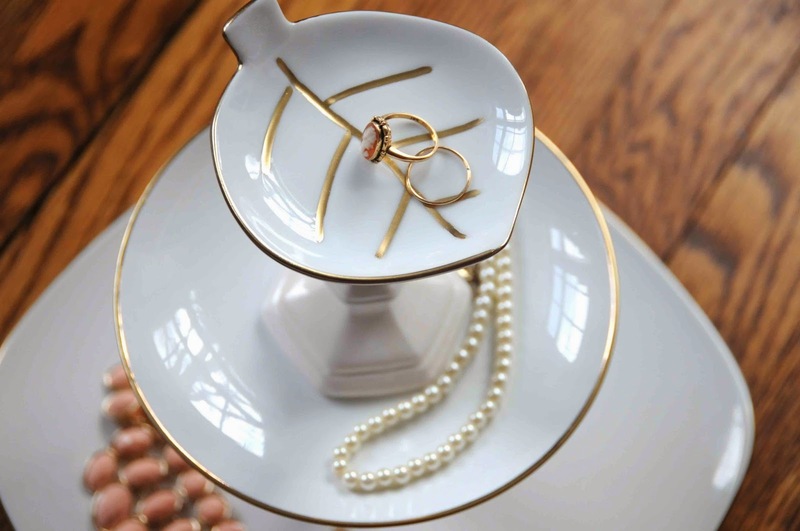 Stacey used three white dishes in which she painted the edges and the leaf mark with gold paint. 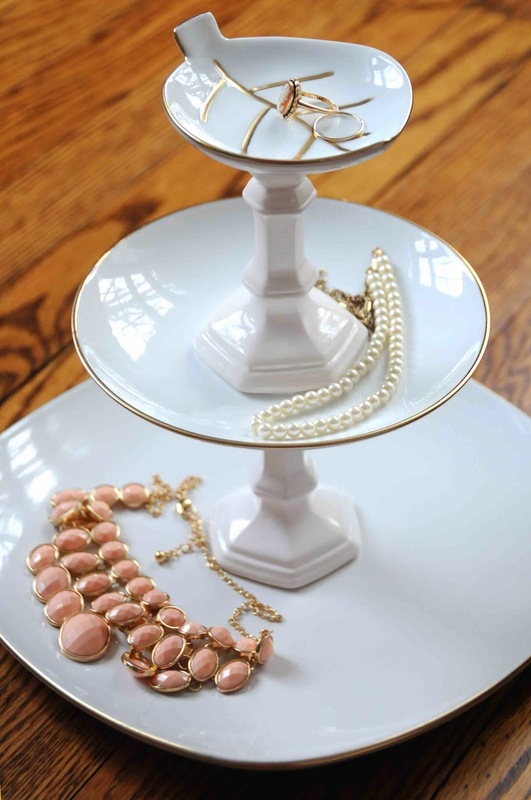 She attached the plates using white candlesticks. HUGE round of applause to all 8 of these thrifty/crafty ladies! 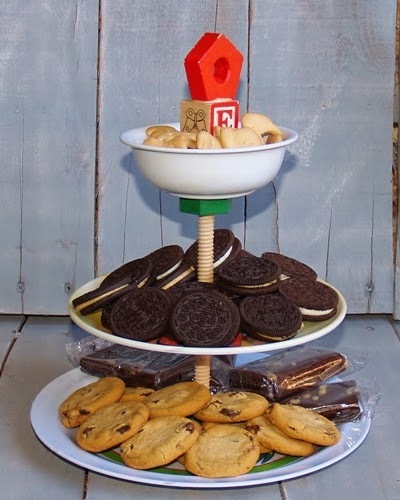 Now it's time to cast your vote for your favorite 3-tiered stand. You can only vote once. Voting is open until Sunday, March 30th at 10pm. The winner will be announced on Tuesday, April 1st. 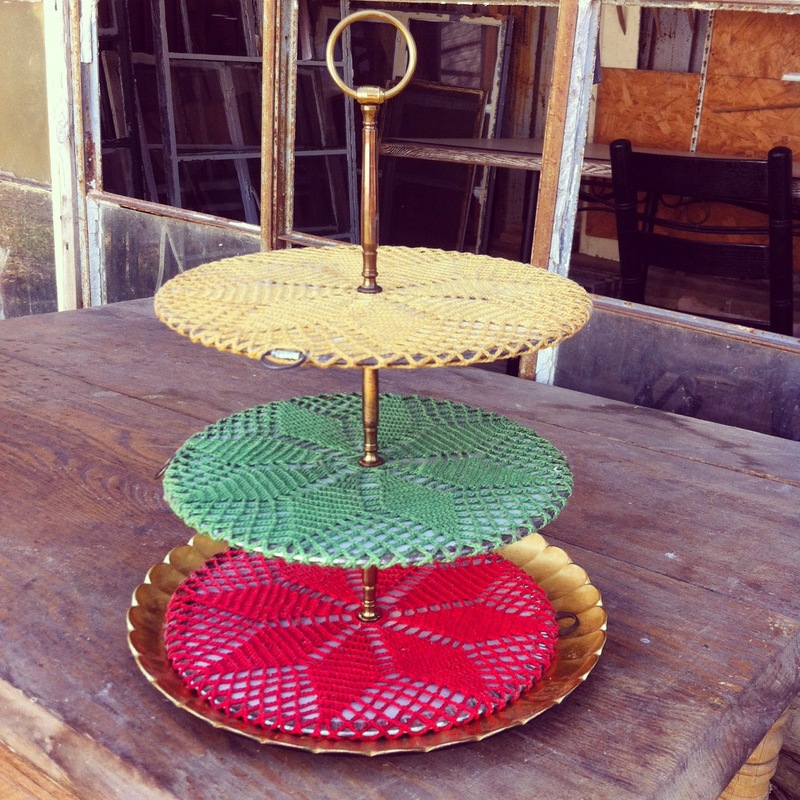 Which 3-tiered stand was your favorite? Don't skip the vote!! (Voting is now closed). 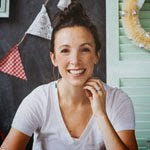 The winner will be known all over blog land as the best 3-tiered stand maker, plus they'll receive a custom hand painted sign and pom pom garland. 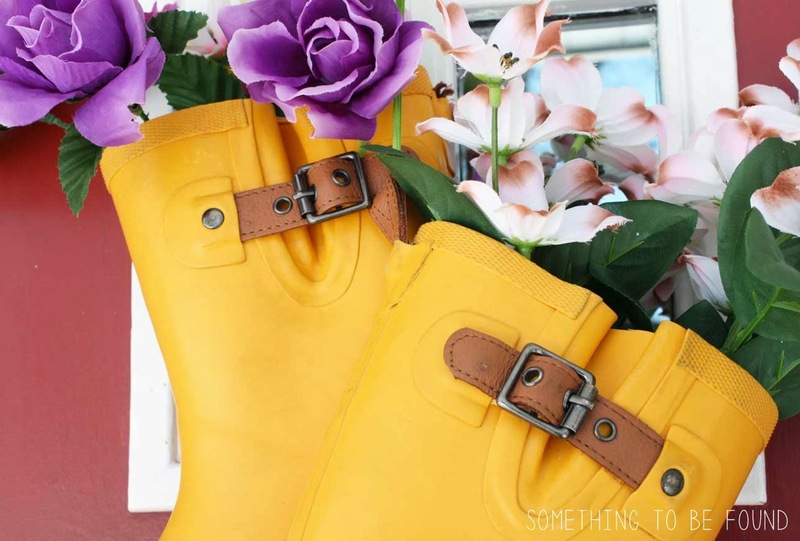 Now let's go check out the results of Dina's Reader Fashion challenge. I challenged her and her readers to recreate this distressed jeans/white blazer look. And guess who gave this fashion challenge a whirl???..... ME! Oh my, I give so much credit to Dina and other fashion bloggers who step in front of the camera on a weekly basis. I only got 2 somewhat acceptable shots out of the fifty that we took! Go. Go now and judge me. Then when you're done laughing, be sure to vote for your favorite reader outfit. (Voting is now closed). 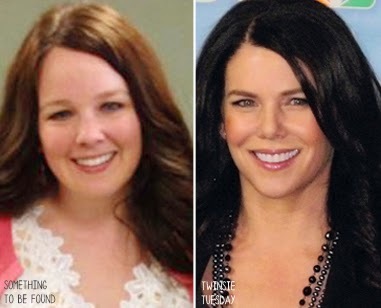 Surprise surprise, I have yet another Parenthood character as a Twinsie Tuesday. So far I've TT'd Dax Shepard (Crosby), Sam Jaeger (Joel), and David Denman (Ed). In the spotlight today is Lauren Graham (Sarah). Her Twinsie? -- my hot, sarcastic, funny friend, Colleen! When asked if I could post a picture of her eating a donut, she responded "I'm not ashamed of eating donuts. Bring it!" 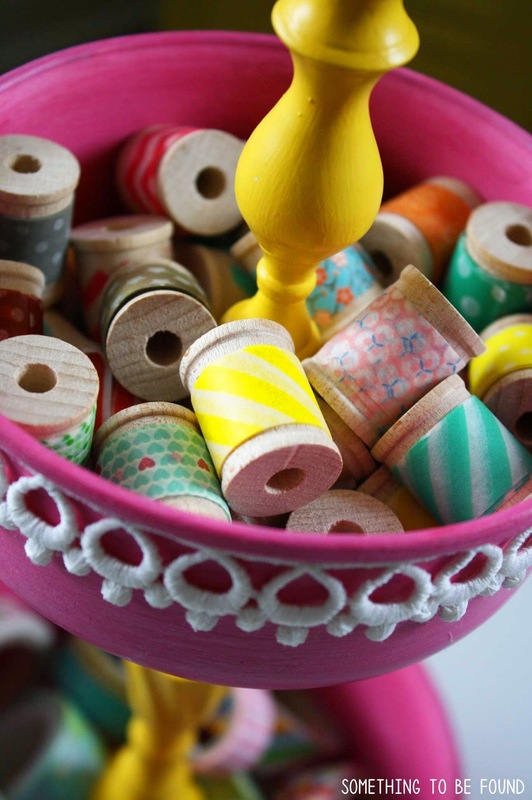 If you follow me on Pinterest you may recall a little board called "Colleen's BIG day!" That's for this lady who's getting married in ONE MONTH. I'm helping her create "Golden Vintage Glam" centerpieces with things like these sparkly garlands. More pics coming soon! 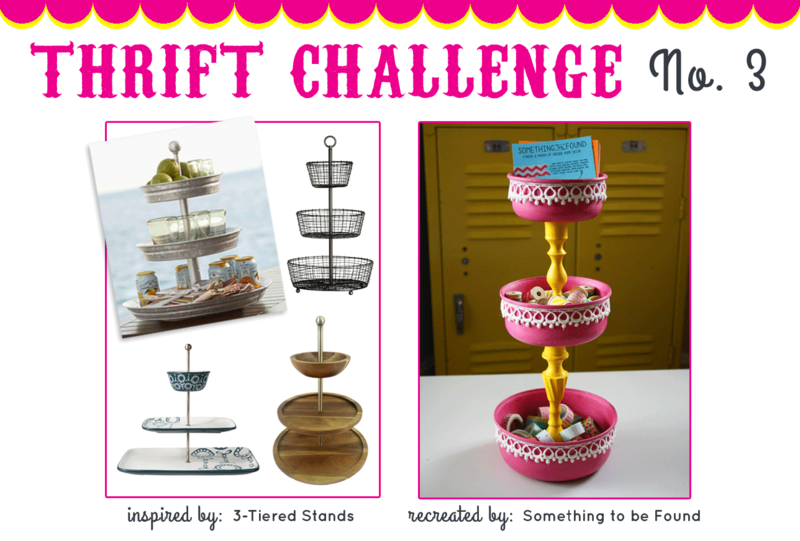 Tomorrow is REVEAL day for the March Reader Thrift Challenge 3-Tiered Stands. Be sure to stop back between Wednesday and Sunday to cast your vote! It’s March and I still have a plaid suitcase, ice skates and an old sled decorating our front porch. After the beating they took this winter they’ve raised their white flags and surrendered. “Replace us!” they cried! This wreath was inspired by similar ones done by RefreshRestyle and Red Hen Home. 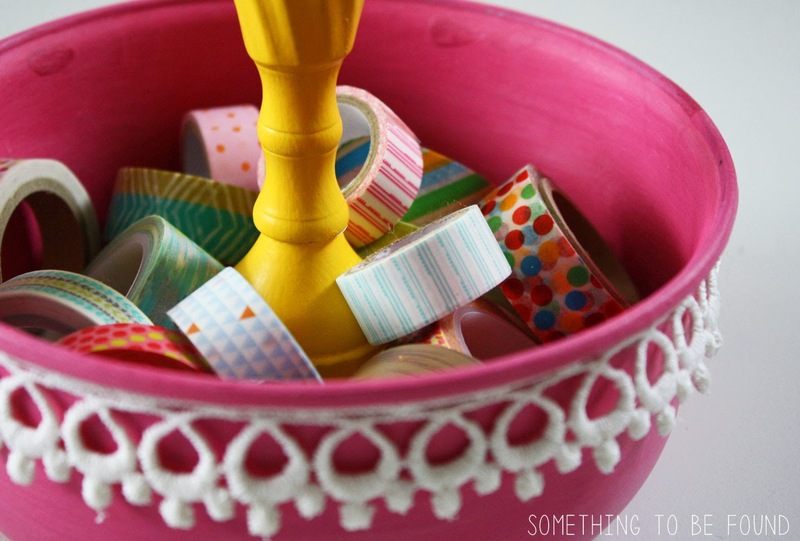 You only need 3 things for this project, making it sooooo easy! 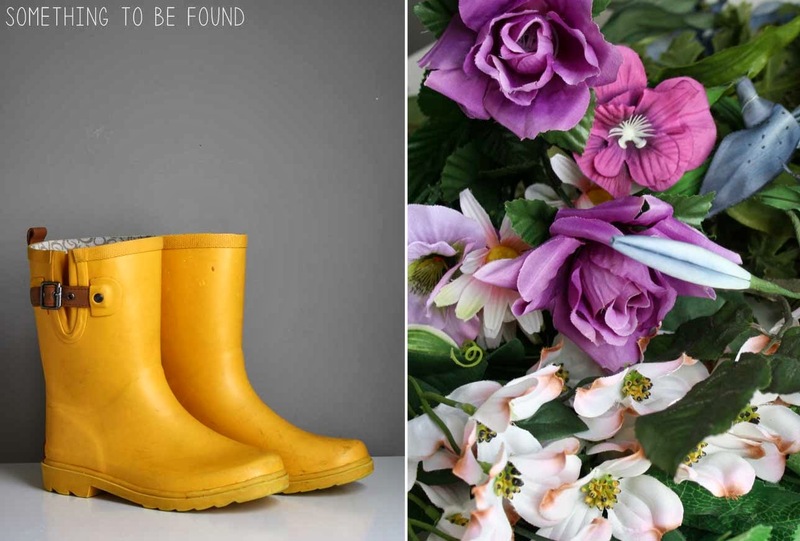 2 | Fake Flowers. Found a ton of these at Goodwill Twinsburg and got the whole bundle (more than I even used) for just a $1. 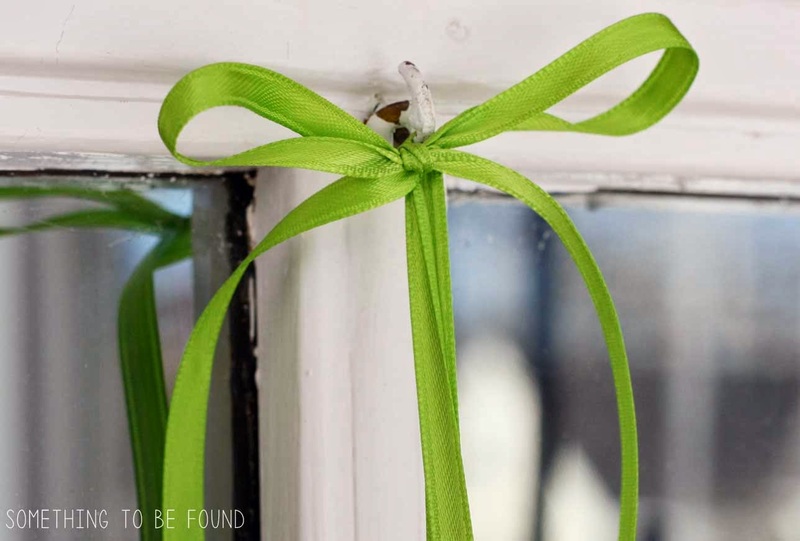 3 | Ribbon or twine or burlap or whatever you want to use for hanging the boot wreath. That makes the total cost of this project, FOUR DOLLARS! 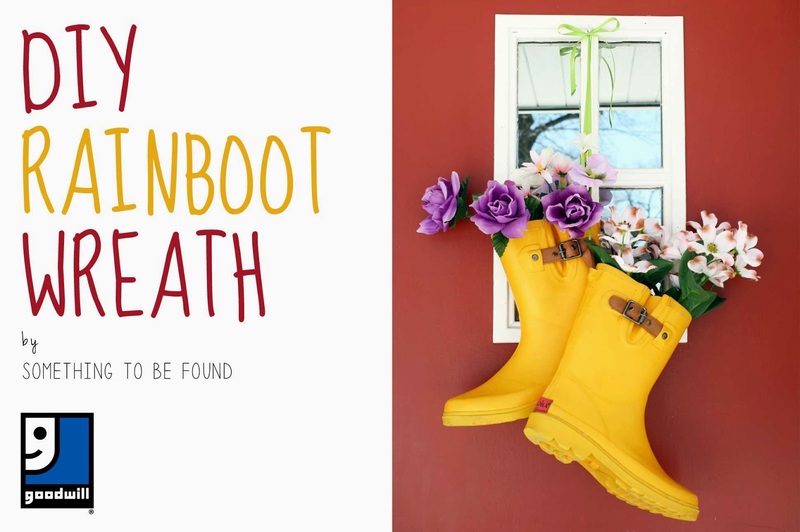 I strung the boots together by weaving the ribbon through the buckle on one boot and the pull-tab on the back of the other boot. 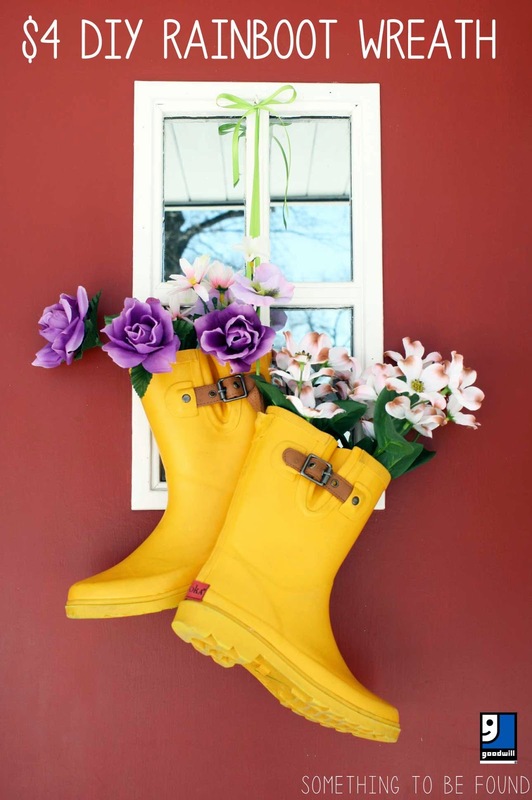 Then I hung them from a pre-existing hook on our front door. And that’s it!! You’re welcome, Christmas decorations. And you’re welcome, neighbors. I had some Twinsie Tuesday nominations sent to me a few weeks ago for "Olympic Twisnie Tuesday" and they were GREAT! 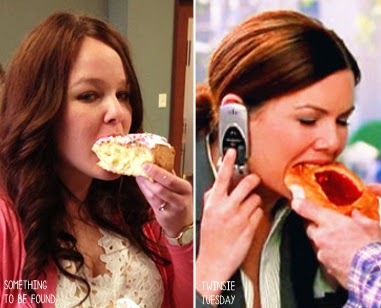 You guys amaze me with your Twinsie-Tuesday-Spotting-Talents! This week, former Royal Twinsie Tuesday herself, Susie S., nominated a Trainer at her work. She texted me his picture and I responded with "OMG!!!!" 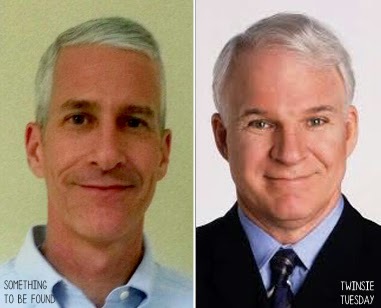 Meet Steve, Anderson Cooper's twin! 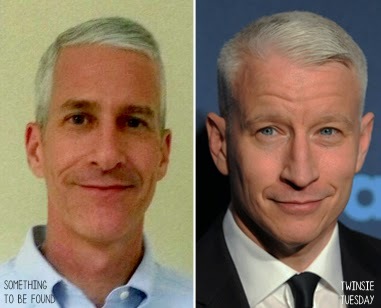 I asked for guesses on Instagram and the amazing doodle artist Amy Lou Hawthorne guessed Anderson Cooper, (way to go Amy!) but there was also another great guess from Shavonda at A Home Full of Color (whose kitchen was recently featured in Better Homes & Garden!) she said Steve Martin!! It's been quite awhile since I've shared my Thrifted Somethings. And that means I have A LOT of them to share so prepare yourself for a post dump of thrifted somethings the next few weeks. The thrift store can be a dangerous place for me. 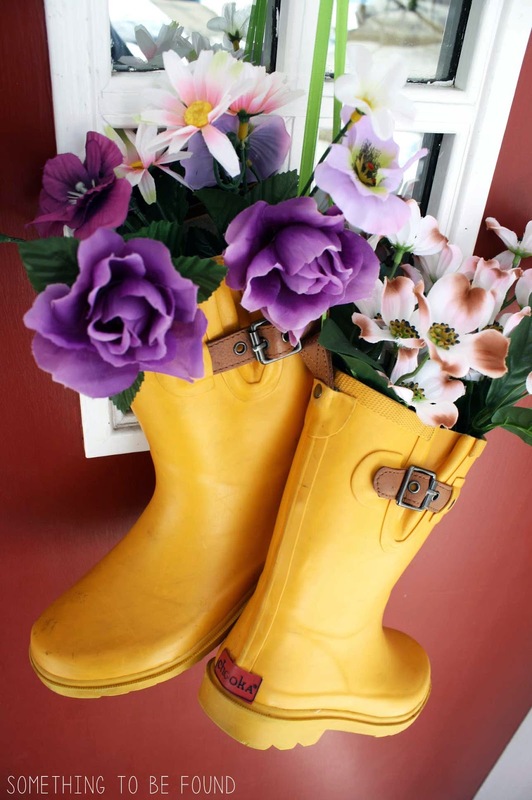 I suffer from oh-its-so-cute-and-so-so-so-cheap-and-I've-seen-it-on-Pinterest-and-I'll-just-get-it-and-hope-I-wear-it-itis. And that's how I end up with a closet full of clothes that I don't wear. 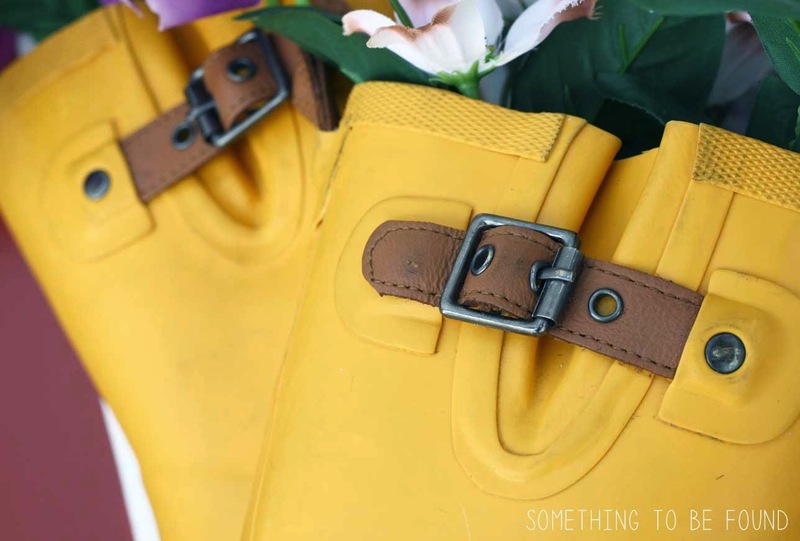 I am working hard to only buy things that I know will get worn, but I think some of that oh-its-so-cute-and-so-so-so-cheap-and-I've-seen-it-on-Pinterest-and-I'll-just-get-it-and-hope-I-wear-it-itis crept back in when I bought these two coats. I think*. I could be wrong! 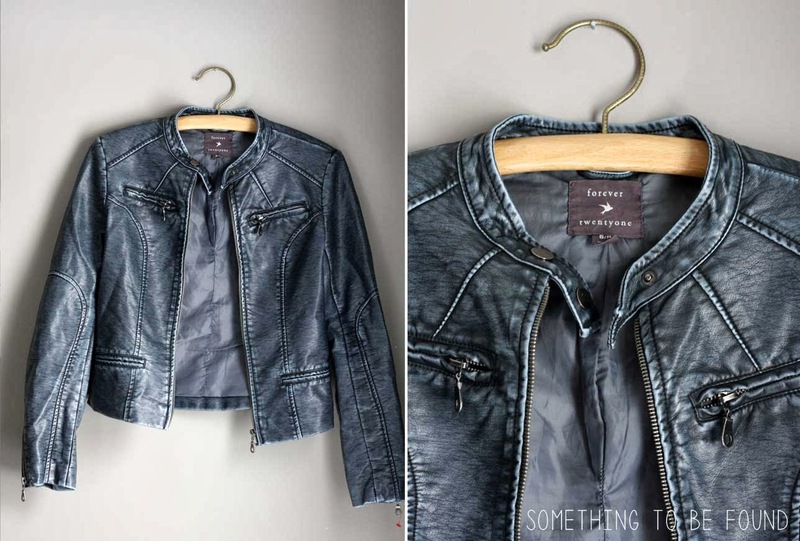 This black leather Forever 21 coat was dressed on a mannequin that was displayed near the checkout lines. I was already being rung up when I spotted it so I bolted to the mannequin and ripped it off without thinking twice about whether I'd really wear it. (or whether the people in line thought I might be crazy). I've got some girls-night-out events coming up so we'll see if it makes the cut! 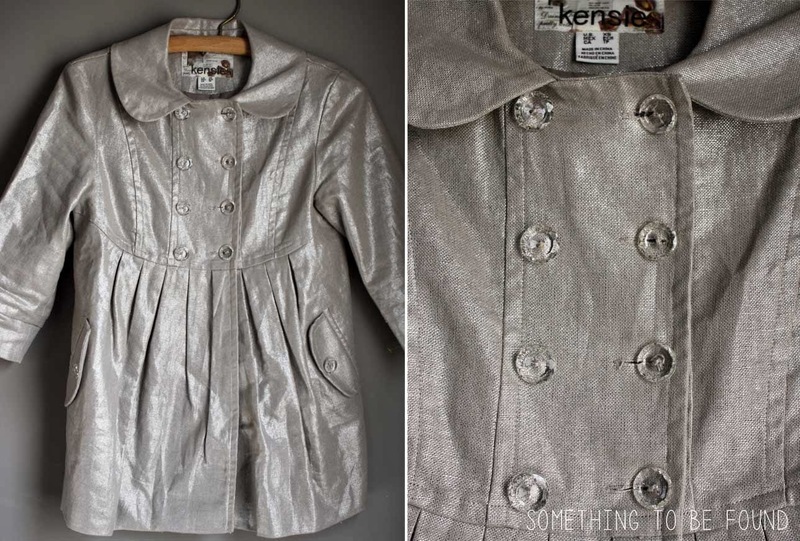 This shimmery gold, 3/4 sleeve Kensie swing coat was too pretty to leave behind. I haven't worn it yet, but I'm thinking it will be perfect for the "Gold Vintage Glam" wedding I"ll be attending next month! 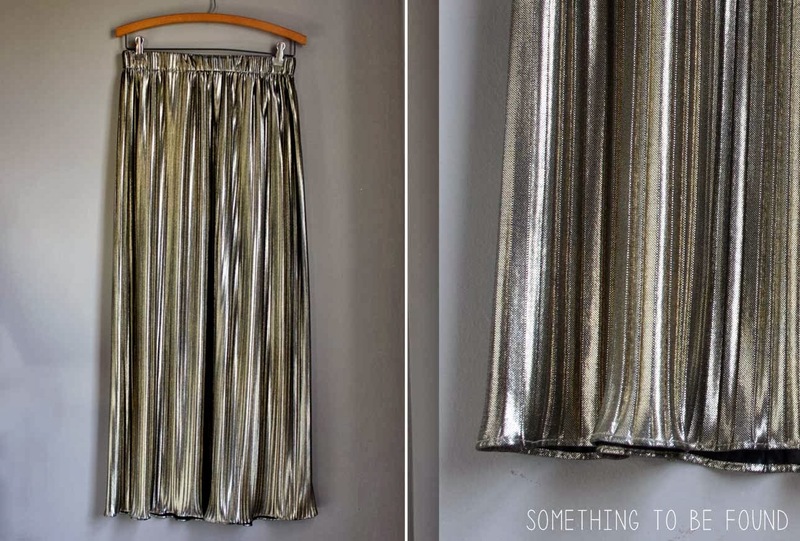 Speaking of that "Gold Vintage Glam" wedding... there is a very good chance I might also wear this gold, vintage, pleated maxi skirt! I found it at Unique Thrift Store in Ohio City back in November. It was $10 which is way too pricey for me at a thrift store, but a friendly store patron gave me a $5 off coupon, making this just five bucks. HIVE FIVE to her! If I see a maxi skirt, in my size, you better get out the way! You can guarantee it will end up in my cart! 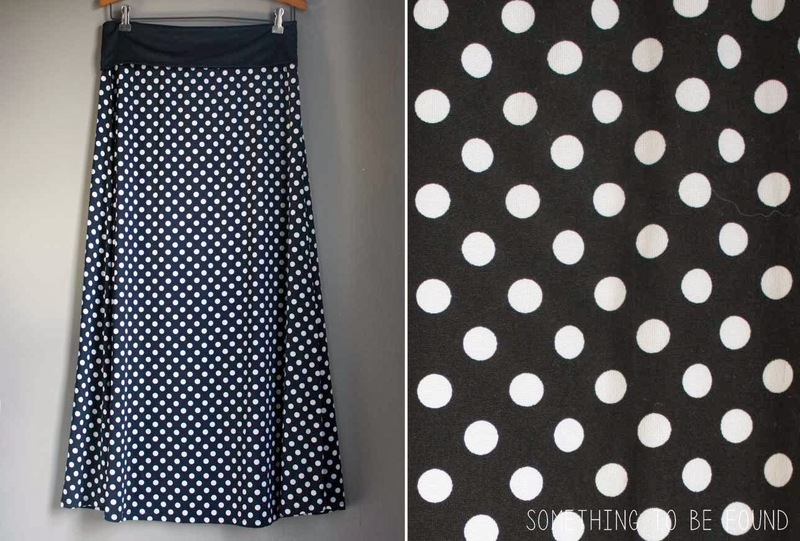 This black and white polka dot one came from Goodwill in Mansfield for a few bucks. 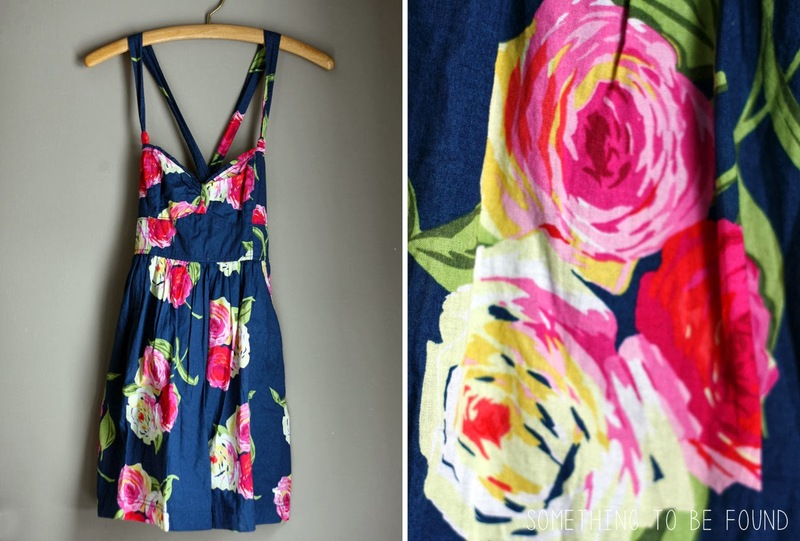 I also picked up this floral Abercrombie Dress at Goodwill in Mansfield. I originally planned to cut it up and use the fabric for a project (I may have just heard a teenage girl screaming) but I may also give it a few wears before taking the scissors to it. ...because this guy was with me when I tried it on and he told me it was "cute!" 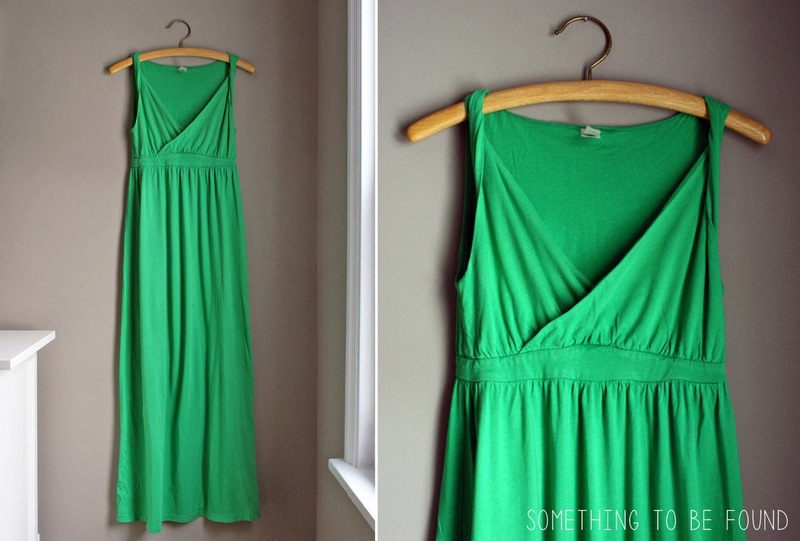 I did a little bit of thrift shopping while in Florida and found two great Maxi dresses at the Fort Meyers Goodwill (right near the Miromar Outlets). 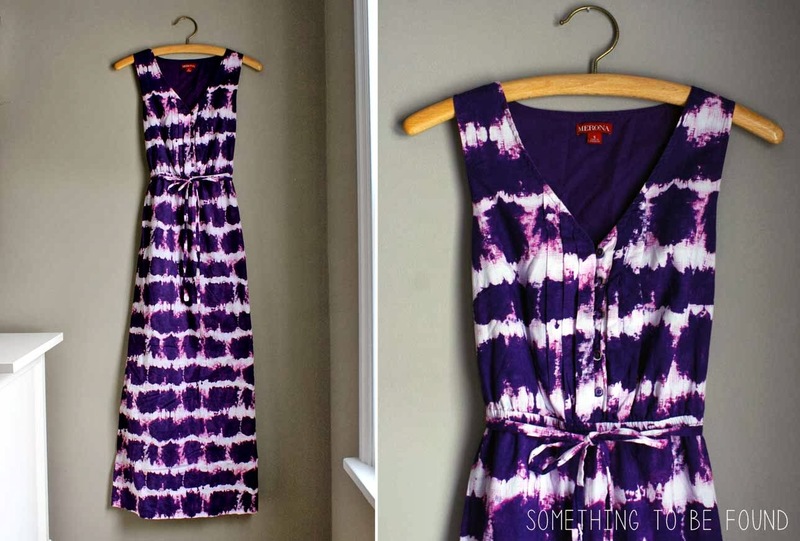 This purple tie-dye looking one is from Target (Merona) and was $7. This green one, which I will be LIVING in this spring and summer is by Route 66 (K-Mart?) and was also $7. 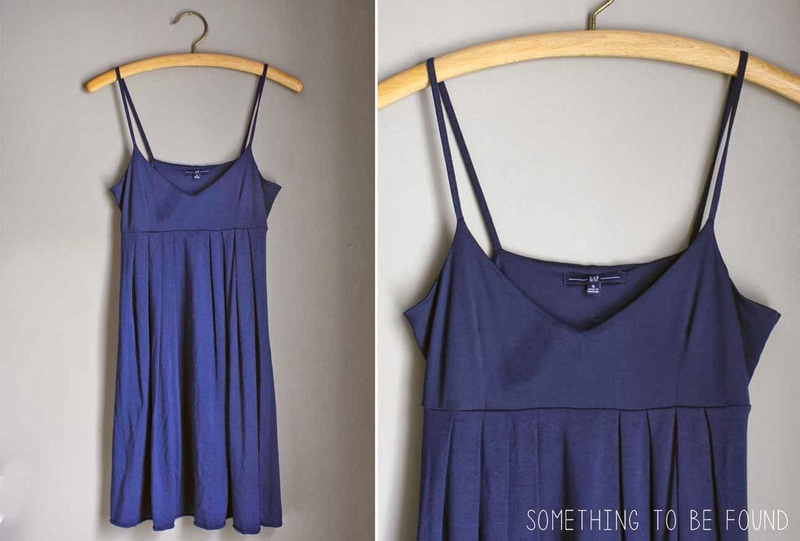 It's the perfect dress for the extremely large baby bump I'll be sportin' this summer. 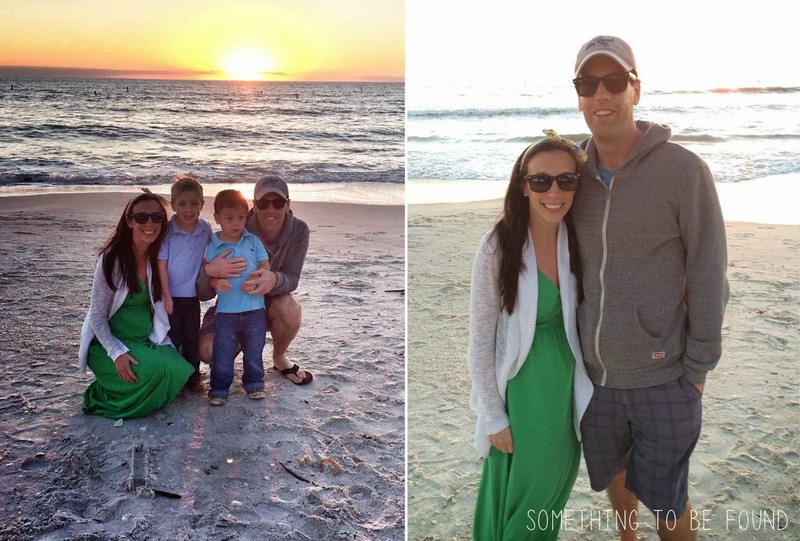 Baby boy #3 is due in July! 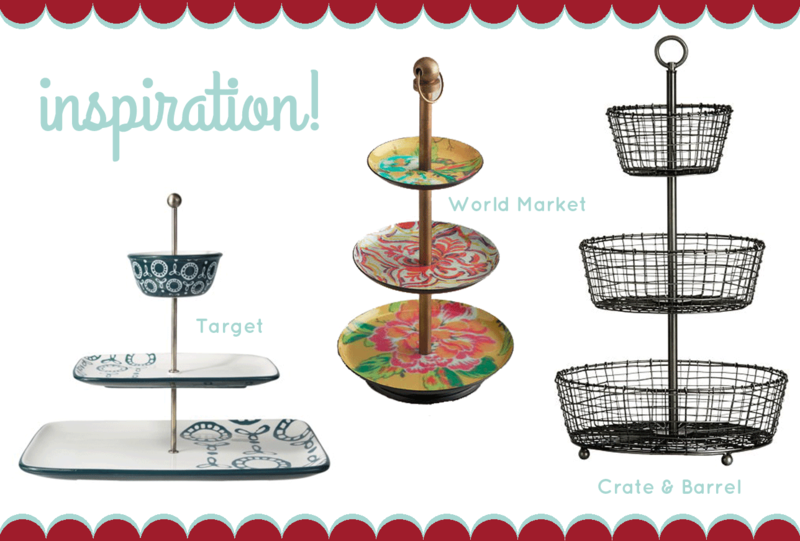 And for even more inspiration, check out my 3-Tier Display Pinterest board. 3 | You do NOT need to have a blog or website to participate. 4 | Leave me a note in the comments or send me an email at somethingtobefound(at)gmail.com to let me know you're participating. 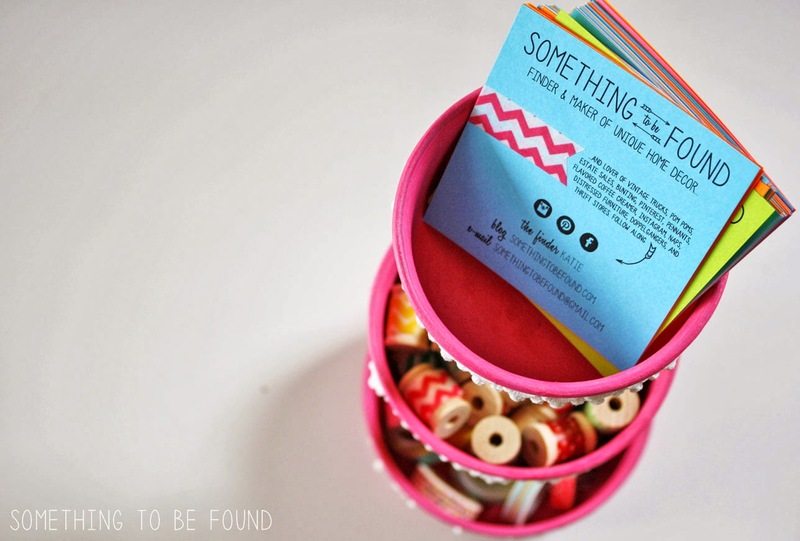 1 | Submit 2-3 quality photos via email to somethingtobefound(at)gmail.com NO LATER than Monday, March 24th at 5pm. 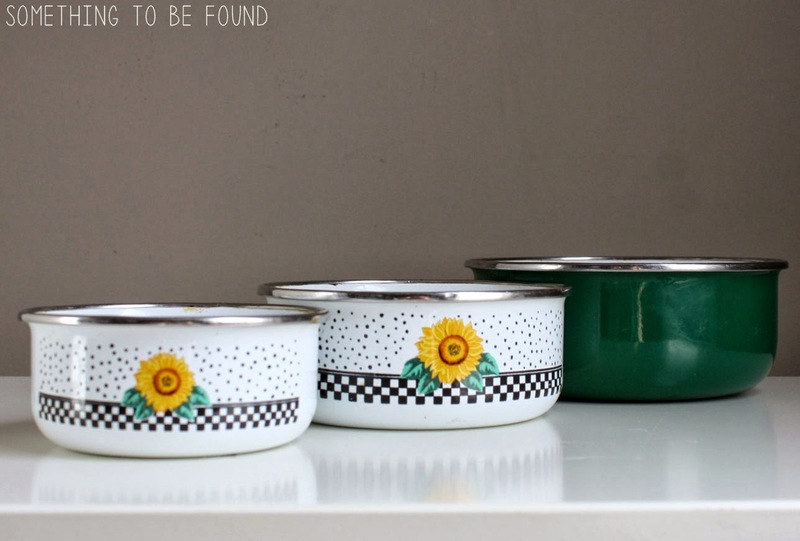 Include your name, where you're from, your blog or website address (if you have one), details on where you thrifted your items from and how much they cost, and a brief "how-to" on how you put it together. 3 | Online voting will be open from Wednesday March 26th through Sunday March 30th. 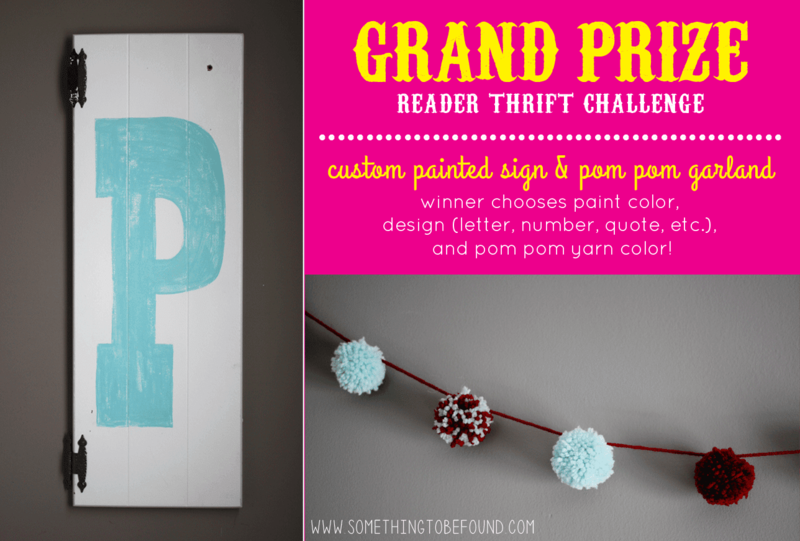 5 | The winner will receive a custom, hand-painted sign and pom pom garland! 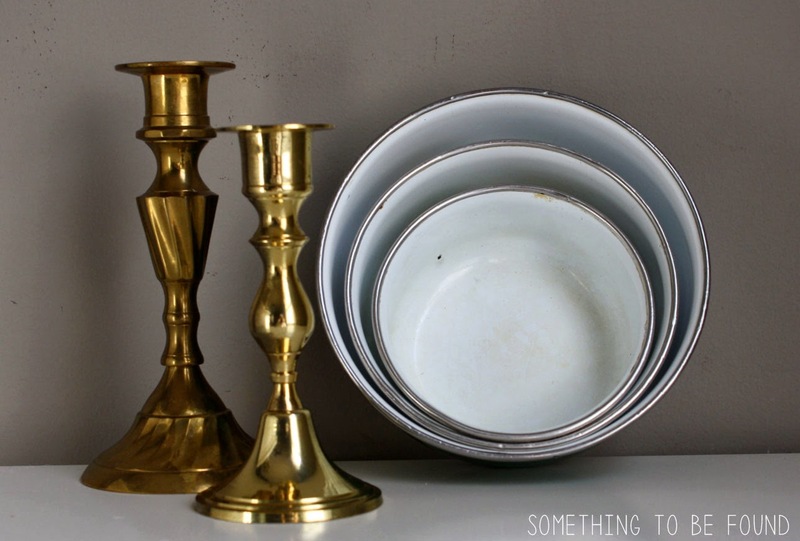 I hope you'll join me in this month's thrift challenge! And don't forget to leave a comment or send me an email if you're participating -- it will make my day!! 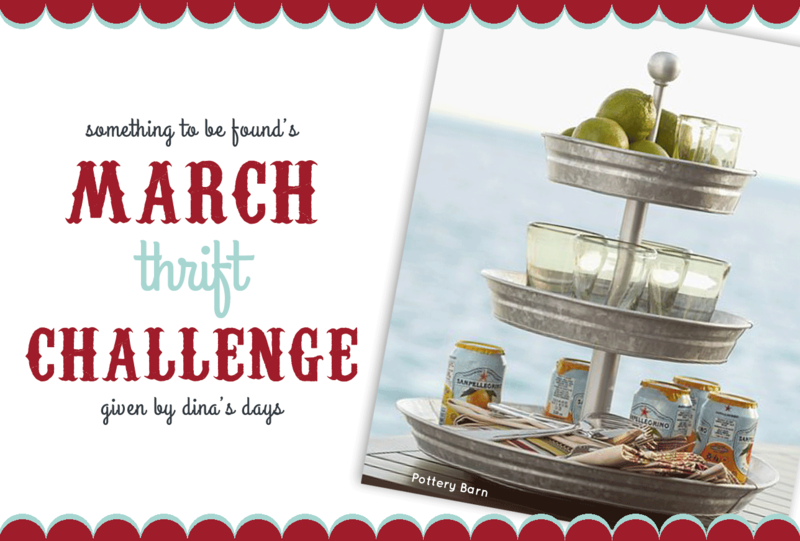 Dina is also doing a reader challenge this month and guess what, you can participate in that one too and have a chance at another awesome giveaway! 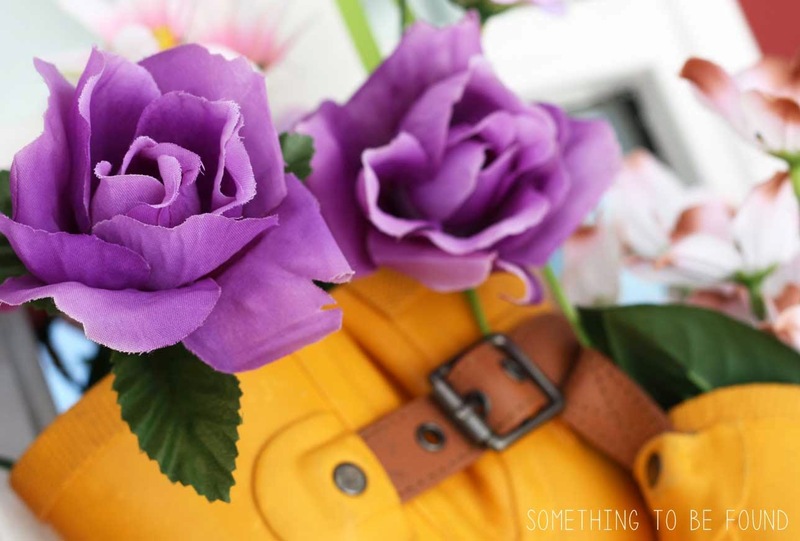 Head on over to Dina's Days to see what fashionable outfit I challenged her and her readers to try and recreate.